We work hard to present our Whole30 program as a tool for creating optimal health, and not a weight-loss quick fix. We have strict rules about weighing yourself during your program (you can’t) and focusing on weight loss as a measure of Whole30 success (you shouldn’t). But despite all our efforts, many people still find it impossible to take their eyes off the scale. So today, we’ll present five reasons to kick your scale to the curb – not just during your Whole30, but for good. 1. Scale weight fluctuates wildly. It’s good to measure things to track progress – and if you weighed yourself monthly, that might help you spot a trend in your body weight (gaining, losing or maintaining). But over the course of a day (or a few hours!) 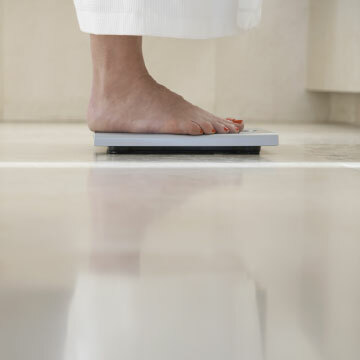 your weight can fluctuate by as many as five pounds – sometimes more. Food and beverage intake, time of day, dietary choices and activity levels all factor into that number on the dial. (And we won’t even mention clothes, because we’re pretty sure most of you are obsessive enough to weigh yourself naked.) You can lose two pounds just by going to the bathroom – and gain it right back by eating a big meal. Those fluctuations are not representative of body fat lost or gained. But seeing a number jump up by four pounds sure does a mental number on you, doesn’t it? Weighing yourself daily tells you nothing about your big-picture trend, and only serves to reinforce the next four points. 2. Scale weight says nothing of health. That number on a scale says nothing about whether you’re moving in the right direction with your health. You want to get skinny? We can make you skinny. Cut your daily calories in half and spend two hours a day doing low-intensity cardio. That’ll make you skinny… for about a month. Until your willpower runs out (as those behaviors aren’t at all sustainable), and your messed-up metabolism fights back. At which point, you gain all the weight back and then some. But hey, for a few weeks, you were skinny! Is gaining or losing five pounds moving you in the direction of better health? It’s impossible to say, because that number tells you very little about what’s going on with your relationship with food, hormones, digestive health or inflammatory status. And those are the factors that impact your health far more directly than body weight. 3. The scale blinds you to real results. By focusing so much of your attention on that number in the scale, you effectively miss out on observing the other, more significant, results of your efforts. You’re sleeping better, have more energy, are less moody or depressed. Your cravings have dissipated, you recover faster from exercise, your symptoms or medical condition have greatly improved. And yet, your program is a “failure,” because the number on the scale hasn’t moved enough for your liking? Re-read point #2, and tell us which factors speak more to your health – the scale weight, or everything else? Those results could be motivating you to continue with your new eating habits – but until you get your head out of the scale, you’ll never be able to see the health progress you’ve actually been making. 4. The scale keeps you stuck on on food. Now would be a good time to revisit the Whole9 Health Equation. If you didn’t experience the Whole30 results you were hoping to see, perhaps it’s time to look at some other factors. All of our Health Equation variables factor into weight loss and body composition – but none of them are reflected in the number on the scale. 5. The scale maintains control of your self-esteem. This is perhaps the most important reason of all to break up with your scale. It’s psychologically unhealthy to allow a number – any number – to determine your worth, your value or your self-image. And yet, that’s exactly what happens to people who are overly invested in their scale. It’s tragic that your daily weigh-in determines whether you have a good day or bad day, or whether or not you feel good about yourself. The scale results can take you from confident to self-loathing in under 5 seconds, but what the scale is telling you is not real. If this is your scenario, ditching the scale is the only way to get back to a healthy sense of self-worth. Let your actions, your intentions, your efforts and your grace influence how you feel about yourself. A $20 hunk of plastic from Target should not be the determining factor in your self-esteem. Dear Scale, It’s Not Me, It’s You. If you’ve got an unhealthy relationship with the scale, the only way to get back to a good place is to ditch it altogether. Donate it to Goodwill, recycle it or take it out back and give it a proper beat-down, Office Space-style. Because the sooner you ditch the idea that the scale is your ultimate measure of success, the healthier and happier you’ll be. Have you successfully broken up with your scale, or are you still stuck in a codependent relationship? Drop your own success story or “Dear Scale” letters to comments. Couldn’t agree more! I weigh more now than I did few years ago doing the crossfit + zone protocols. But since I ditched the scales (both for myself and food) and just focused on being healthy, my sleep has improved tremendously, I’m STRONGER, clearer skin, and overall just a happier person! Whole30 finally enabled me to break up with my scale, hopefully for good. I check in with it now and then but I no longer feel bound by it (or to it). I look at how I feel and how my clothes fit to tell me how I’m tracking along. Thank you for helping so many people! Love this and couldn’t share it fast enough with my clients. They hate it when I tell them to ditch the scale! I broke up with my scale when I started CrossFit. Now that I eat clean I check my weight every now and then to see if I’m starting to gain weight. Thank God I’m no longer breathing out all my air and hoping for a certain number. A life defined by a number on a scale is a sad, scary and dangerous one. If you are being the healthiest YOU can be then the scale is a pretty pointless piece of equipment taking up room on your bathroom floor. Thanks for this, just as Heather said. I needed it today, I weighed myself in and was upset with thenumber a 5 pound difference from Friday! I did not gorge out over the weekend, and my brand new size 6 (down from 12s 2 months ago) jeans fit perfect. So waht the heck piece of plastic, why do you hate me so much and make my life miserable. I hate that piece of plasic and it determines my mood for the rest of the day. So today I am breaking up with you becuase you are an insensitive and harsh. I dont need you in my life anymore. I know we haven’t seen much of each other lately. I have to admit I’ve been avoiding you. Not because I’m afraid of you, but because we don’t have much in common any more. You’ve yelled at me too many times, given me cheap false hope, and lied to me. This is it. I will visit from time to time, but I see that our friendship belongs in the past. I’ve moved on, and the gossip you pass on is not something I need any more. Thanks for trying. ps, You might have a hard time recognizing me. I’m stronger, fitter, and yes, leaner than you’ve seen me in many years. You did your best! Thank you for this article today of all days!! I’ve been weighing myself every day again, since starting Crossfit. I will dump my scale when I get home from work!!! Thank you so much for posting this today! I finished whole30 last week and was doing okay with not weighing myself and had only weighed myself once when I finished, however this week I’ve weighed myself every day and it has been affecting my mood and when I saw it had gone up since last week I was really annoyed at myself. So I’m going to banish the scale to a cupboard so that I don’t see it every day and be tempted by it. This is a great post–and great follow-up to the comment you wrote last week in response to one I had left about completing my Whole30 and not losing any weight. Thanks Melissa, for both. The thing is, even though I didn’t lose weight, I still want to keep eating this way. I like it. And I’ve been recommitting to a serious vinyasa yoga practice because suddenly I feel like I’m ready to push myself physically, and I’m someone who has NEVER identified herself as athletic. I bought a pair of size six pants recently, which was nice. So I see good things (hello, great skin, anyone?) But the number still haunts me, I have to admit. Honestly, I haven’t looked at the weighing scale for years already. Yes I gained weight and am now trying to get fitter. I may buy one in the future but I don’t think it’s important because I can see if I lost weight just by fitting into clothes and looking at the mirror, can’t I? I’m glad you’re all finding this perspective healthy, and helpful! You can absolutely judge body composition by the way your clothes fit, but that doesn’t always mean you’ve lost weight. I look leaner with 5# more of muscle on me – scale has gone up, but I look and feel so much better. The number means little! I am working on it. I returned the new scale I bought a few weeks ago. I now only have an erratic scale at home….and I am not stepping on that one each day. ; I am starting the Whole 30 on Monday. I have a great deal of weight to lose so I am not sure if photos and such will show visible change after 30 days…what to do when you have more than 100 pounds to lose to track success? We certainly encourage weighing yourself and measuring yourself before and after your Whole30 – just not DURING. And when you’re done with your Whole30, you can certainly use the scale as one indicator of progress – just not every day. Daily weigh-ins tell you little about the trend, but I can certainly see bi-weekly weight checks to see how you’re doing big picture. The key is making sure you’re not so invested in the number on the scale that you forget about the bigger picture – making yourself HEALTHY, long-term, sustainably. Best of luck on your Whole30! Make sure you join our Whole30 Facebook page – you’ll find lots of support, encouragement and resources there. http://www.facebook.com/whole30. Thanks for the additional reply, Melissa. i am already on your facebook pages and agree there is a lot of encouragement and resources to be found there. Thanks for everything. When I started working out with Emerfit in Fort Collins (Melissa and Dallas, I think you know them) my goals were to lose 15 pounds and drop 5 minutes off my sprint tri time. Now, after 6 months of good exercise and one Whole 30, I dropped 2 dress sizes, dropped 5 minutes off my 5k run alone, and GAINED 2 pounds. I think it’s pretty sad that my children’s Wii fit is telling me that I fall into the overweight category…maybe I shouldn’t let them play with it. Dear scale, I kicked u off to the curve good bye. I am currently reading the book it starts with foods and I am so ready to keep changing my life to a healthier lifestyle. I would gladly appreciate it a lot if I can get all the help you guys can give me! I been stuck idk what’s going on but hope u guys can help me! I workout and eating clean but by so far reading the book I see that I’m not eating as clean. We’ll thank you both and hope u hear from you guys soon! Jasmine, there is a ton of support on our free Whole30 forum! http://forum.whole9life.com. It’s currently down for maintenance, but please check back tomorrow, register, and then let all the participants and our awesome moderators give you all the support you need! For most of my youth the scale was my worst enemy. I had no context for the numbers I was seeing. I didn’t know what was good and what was bad. My mother is amazing and she worked very hard with me to eat healthy and work out but nothing she did could stop me. It didn’t matter, I’d obsess over the number. 134 was everywhere. Not just on the scale but a bright red light behind my eyelids every time I blinked. I was getting stronger, making healthy choices, and playing sports. Looking back now I want to pull my 16 year old self off the scale and tell her “it’s okay, forget it” but I could only see the difference if it was on the scale. 127….124……122. I’d reached my “goal” but I couldn’t see me. Now I just wanted the number to be lower. My driver’s license said 120 and 115 sounded good. It sounded attractive. It wasn’t until I was 20 years old and I’d weighed my self right before a doctors appointment that I reached my scale breaking point. 122 that was ok, I like myself at this size. Then the doctor’s scale said I was 135. What? Wait. WHAT? That’s when I decide to break up with scales all together. 135? 122? It no longer mattered. I was tired of caring. I felt good I didn’t need the number anymore. Now four years later I weigh myself every 6 months if that and I don’t let doctors tell me what I weigh. Because you can’t obsess over a number you don’t know. I don’t need to know. I’m healthy, I feel good, I look good. I’m on day 11 of the Whole30 (Struggling but sticking with it!). So scale thanks but no thanks. I’m good. THIS. I love this so much – 135, 122, it doesn’t matter! And I bet you are that much happier (and healthier!) for ditching your scale, too. Thank you so much for sharing. I hope your story inspires someone who is struggling to kick their scale to the curb. I get the whole scale thing, but for those of us with a lot of weight to lose, because being overweight is unhealthy, we need to have that needle move. I am over 50 pounds overweight, I need to avoid medical problems that weight loss provides.